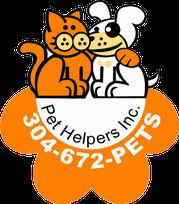 Available Pets - Website of Pet Helpers, Inc. The adoption fee on our puppies and mixed breed adult dogs is $150, full blooded dogs are $225, cats/kittens are $50. All of our pets are spayed/neutered prior to adoption if they are old enough. If you are adopting a puppy, you will be required to spay/neuter the pet at your expense by the age of 6 months and provide a certificate to us from your vet. All of our pets are checked by a veterinarian, given the shots appropriate for their age and any other treatment deemed necessary. All of our pets are adopted as indoor pets, other than normal outside play time. All existing pets in your home are required to be spayed/neutered. We do not have a facility. All pets are in foster care. Once your application has been processed, we will make arrangements with the foster family for you to visit with the pet so you can decide if you wish to finalize the adoption. Thank you for considering a rescued pet.